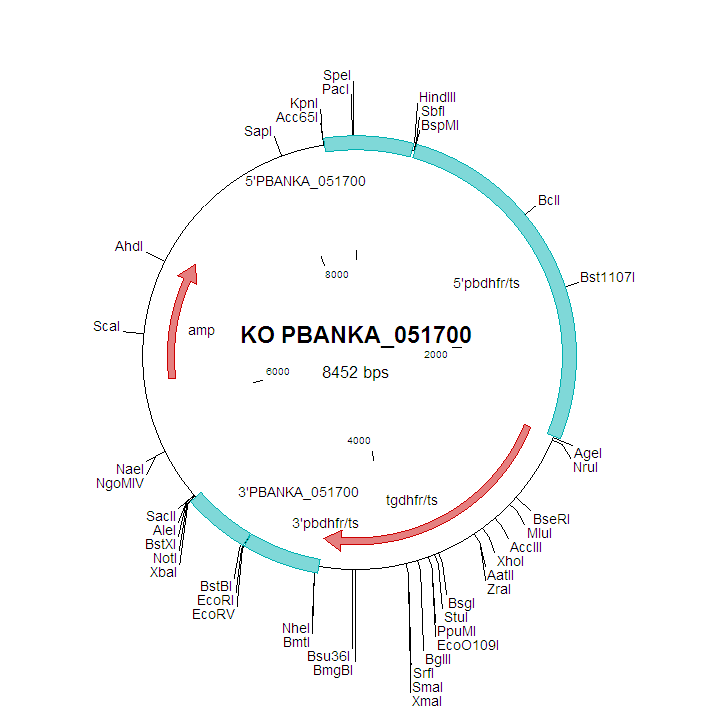 The P. berghei etramp10.2 has an internal chromosomal location and is syntenic with P. falciparum etramp10.2. Attempts to delete the ortolog of P. yoelii (PY17X_0518100) were unsuccessful (RMgm-645). A pyrimethamine-resistant parasite population was selected after transfection with a construct for targeted gene disruption by double cross-over homologous recombination. The primers of the two target sequences of the gene are provided below. 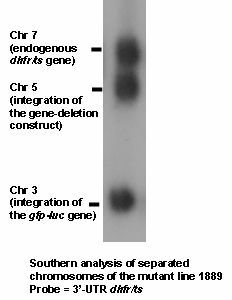 Diagnostic PCR (for correct integration of the construct) and/or Southern analysis of PFG-separated chromosomes (to show integration into the chromosome on which the target gene is located) have been performed (see below). This analysis provided evidence for correct disruption of the gene indicating that it has no essential function during asexual blood stage development. However, no further analyses on the parasite population/cloned lines have been performed to show absence of transcripts or protein. The phenotype of the selected parasite population/cloned lines has not been analysed in detail. No obvious growth defects of the asexual blood stages of the selected parasite populations/cloned lines have been observed.